At least 40 firefighters have tackled a 'severe' fire in Fordingbridge, which has destroyed a house. Crews from Hampshire, Dorset and Wiltshire were called to Wood Green yesterday evening (Tuesday 2 December). The occupants were not home at the time but the neighbours were alerted to the fire by the smoke alarm and they called 999. On arrival crews were faced with a large detached property with the first floor and roof well alight. 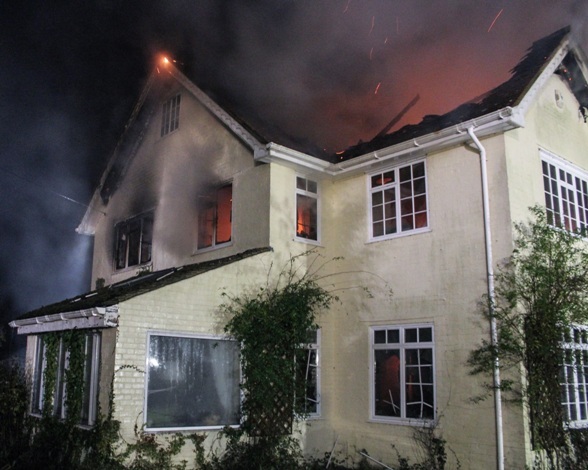 Hampshire crews, with the support of crews from Wiltshire and Dorset Fire and Rescue Services, worked together to contain the fire and stop fire spread to other properties. The fire service says the 'impact of the incident on the community is minimal' due to the rural location. An investigation into the cause of the fire will start this morning but it is not thought to be suspicious.